Under one proposal, Metro would stop running trains at 10 p.m. on Sundays and at midnight on all other nights. Another scenario calls for stations to close as early as 11:30 p.m. on weeknights and midnight on Fridays and Saturdays. A third scenario would close stations at 11:30 p.m. on weeknights and 1 a.m. on Fridays and Saturdays. Metro is proposing some major changes to the times the system opens and closes. The transit agency says the system needs to be closed longer so that critical maintenance can be completed. Under one proposal, Metro would stop running trains at 10 p.m. on Sundays and at midnight on all other nights. Another scenario calls for stations to close as early as 11:30 p.m. on weeknights and midnight on Fridays and Saturdays. A third scenario would close stations at 11:30 p.m. on weeknights and 1 a.m. on Fridays and Saturdays. Opening times remain the same in most of the scenarios, but stations would open at 8 a.m. Sundays under the third scenario. Metro's customer service committee voted to hold a hearing in October to allow riders and and business owners to talk about the impact of reducing late night rail service. "I think we all know what we have in front of us, and to think that we can just push this aside and continue business as usual, we cannot do it," Metro General Manager Paul Wiedefeld said. 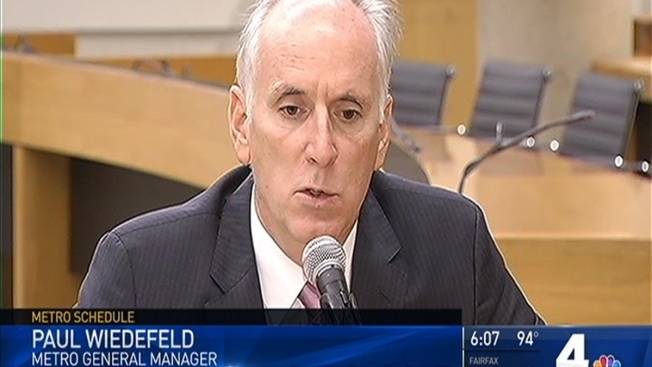 Wiedefeld says closing early would allow more time for Metro repairs. "The additional track time increases safety and reliability by giving workers the time and space they need to keep Metro's infrastructure in a state of good repair," Wiedefeld said in a statement back in July. But business leaders and riders are concerned the plan will have negative consequences. "Metrorail service in D.C. is a major economic engine," Board member Tom Bulger said. He said he won't vote for any of the proposals without more information. Metro riders who work at night are concerned about eliminating Metros late night service. "That's where we got to figure out if there are things we can do with the bus system to basically capture those rides," Wiedefeld said. Many riders voiced their frustration with the proposal on Twitter. "God help you if you're a service employee who works weekends," Ben Weingrod ‏said on Twitter. Becca Grawl said, "I already struggle making it to work on Sundays with a 7 a.m. opening. 8 a.m. is a slap in the face."